What is vitamin D3? 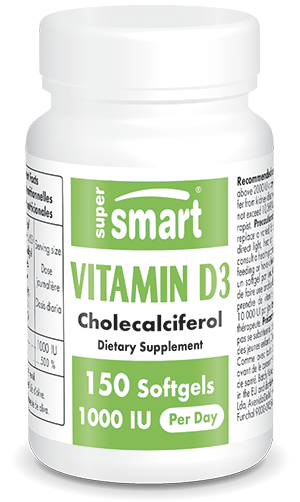 Also known as cholecalciferol, it is a form of vitamin D. Vitamin D3 is found in animal products and once ingested, it is converted by the body into 1.25-dihydroxyvitamin D, the active form of the vitamin. What is vitamin D’s role? Vitamin D is essential for good health. Its role is to increase absorption of calcium and phosphorus in the intestines, an important mechanism that enables optimal mineralisation of tissues such as bones, cartilage and teeth. By encouraging calcium and phosphorus absorption, vitamin D helps maintain adequate levels of these minerals in cells. What are the sources of vitamin D? Vitamin D is both produced by the skin on exposure to the sun, and provided by the diet. It is naturally present in vitamin D-rich foods such as oily fish (salmon, herring, sardines, etc), and is also available as vitamin D supplements. These are particularly useful for correcting commonly-occurring deficiencies in vitamin D.
What are the consequences of insufficient vitamin D? Inadequate vitamin D can lead to various complications such as osteomalacia, rickets, psoriasis, reduced muscle tone, tetany seizures and in some cases, anaemia. How much vitamin D do we need? Our requirements for vitamin D vary according to age and may be greater at certain stages of life. Some people are therefore at higher risk of vitamin D deficiency: new-born babies and infants, pregnant women and the elderly (particularly those in institutional care), whose exposure to the sun is limited and/or who have increased needs. Other factors may exacerbate the risk of deficiency such as high skin pigmentation, particular diets (elimination of meat, fish, eggs, dairy products), and diseases resulting in gastrointestinal malabsorption. Why choose the formulation Vitamin D3 1000 IU? Our supplement helps to correct highly prevalent vitamin D deficiencies and offers vitamin D3 benefits such as preventing muscle weakness, falls, and osteoporosis. It has also proved beneficial in treating rickets and psoriasis, an inflammatory skin disease. How effective is the formulation Vitamin D3 1000 IU? The form used increases the bioavailability of the vitamin D3, enhancing its absorption by the body. The vitamin D3 dose is listed in the form of international units (IU), 1 microgram (µg) being equivalent to 40 IU. This means our 1000 IU formulation provides 25 µg of vitamin D3.